Tilapia is one of the easiest fish dishes to make on your Foreman Grill. 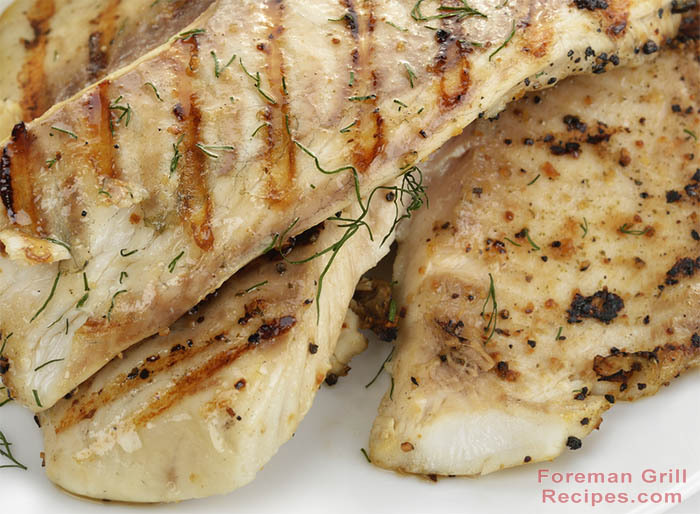 This recipe uses the basics for making grilled tilapia. The one exception is the smoked paprika. It’s a wonderful addition and adds a nice smoky flavor that you’d normally get from an outdoor grill. Tilapia is a light, flaky, mild tasting white fish that is nutritious and delicious. Once you try this recipe on your Foreman Grill, you’ll find yourself making it again and again. Brush tilapia filets with olive oil and coat well with remaining ingredients. Preheat your George Foreman Grill to medium high (if you have heat settings) for 5 minutes with the lid closed. The tilapia will have nice grill marks and flake easily with a fork when done. It should take around 5 minutes. Excellent when served with fresh steamed broccoli and wild rice. How do you grill flounder (preferrably rolled in cornmeal) on the george foreman grill? If cornmeal is not recommended, please send me a recipe for the flounder. thank you. This recipe was delicious!! All I did was wash the tilapia seasoned it with paprika,seasoning salt, garlic powder, accent, and pepper and i put it on the grill for like 20 mins it was the bomb.com I made some fresh spinach on the stove and popped a bag of white rice steamables in the mic and I smashed!!! I would not recommend using corn meal or flour on the foreman grill. Not even Crisco but I’ve seen others recommend Crisco. I tried that with chicken. I had to ash it out over again 3 times and was still removing it with paper towels. I have done breaded chicken on my Forman. I put tinfoil on both top and bottom, no clean up problems. As a matter of fact I use the tinfoil all the time. My Forman is around 20 years old and the finish has started to come off on the ridges . This has helped me to extend the life of my Forman. my george foreman grill only says 1,2,3,4,5 on the dial. A book did not come with it. How do I know what number to cook on????? It is just trial and error? If you can assume that 1 is low, 5 is high, then 3 would be medium and 4 would be medium high, right? Unless it’s the other way around.